John Dorney reports from a talk by Conor McCabe of the Labour History Society on the Railway strike of 1911. In late August 1911, the Irish Worker defiantly proclaimed on behalf of railway workers, “in the future we are not going to have the crawling into the office of any body of railway directors”. In future, workers would stand up for themselves, and take things like union recognition, higher pay and shorter hours as rights. Just two months later, after a disastrously unsuccessful nationwide strike on the Great Southern and Western Railway, union leaders were pleading with William Goulding, head of the company to take back their workers – 10% of whom were going to be sacked for their participation in the strike. When asked if he could not exceed the figure of 90% re-hiring, Goulding replied that it was “quite impossible”. In private, Goulding told associates, “now that we have the men defeated, we’ll never have any more trouble”. The strike was a humiliating defeat for the workers. 10% of them lost their jobs, houses and pensions as a result of it. The period before the Great War saw a wave of labour militancy across Europe and in Britain and Ireland in particular. The railway strike, Conor McCabe told the audience at the Labour History society, was one of ‘a cluster of strikes’ over union recognition that culminated in the great Lockout of 1913. But the “dog that didn’t bark in 1913”, McCabe argued, was the railwaymen who had been crushed by Goulding in 1911. For Padraig Yeates’ thoughts on the impact of the railway strike on the Lockout see here. Loss of a job by 10% of the strikers amounted to a, “Roman decimation”, in McCabe’s words – a personal calamity that resulted not only in a loss of income but also in eviction from their house and loss of pension. This may have prevented the Dublin lockout from being a nationwide strike and “all-out class war”. McCabe opened his talk with the quote from Shakespeare, arguing that the great labour battles of the 1910s were not only economic clashes of interests, but also power struggles between two ‘houses’; capital and labour, and were equally battles over ‘dignity’ – whether big employers had absolute power over their employers or whether they had to negotiate with them ,in the language of the time, “as men”. 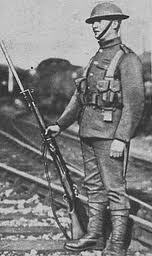 A British solider guards train tracks. The photo is actually from Wales in 1919 but similar scenes took place in Ireland in 1911. There were two railway strike in 1911, one brief and successful the other longer, larger and ending in complete defeat for the strikers. The first was really part of a British strike, with Irish workers at the North wall in Dublin joining a strike called by the Amalgamated Society of Railway Servants, or ASRS. They were joined fairly promptly by the James Larkin’s ITGWU. However, following negotiations in London, the strike was settled within 24 hours. The second strike began on September 15th, when railway workers refused to handle goods from a timber yard that had sacked workers for union membership. They were in turn sacked by The Great Southern Railway Company leading to an all-out strike along the lines to Limerick, Cork, Kerry, Waterford and Tuam. William Goulding, the owner of the Great Southern, who was just as determined to wage class war as any syndicalist, had a number of powerful weapons at his disposal. The first was money – those who worked throughout the strike were paid a 10 pound bonus, part of which they were still receiving years later. Station masters were given clocks in gratitude at the end of the strike. Another was exploiting sectarian animosities – northern Protestant workers were brought south to take the places of striking southern workers for the duration of the strike. And in the final resort, he had the force of the British state. Thousands of British soldiers were drafted in to man the lines and stations and to make sure they were not blocked by pickets. One observer thought that, “it looked as if all Ireland was turned into a military camp”. Goulding’s approach in rejecting all arbitration – which had previously been carried out by people such as Catholic Archbishop Willie Walsh and nationalist activist Michael Davitt – represented a new departure. Not all businessmen agreed with it – in Tuam the small business association called it “hard hearted treason”. By late September, the workers’ representatives were indeed, contrary to the Irish Worker’s confident prediction, ‘crawling’ to Goulding to beg for reinstatement. The company took back workers identified as, “quiet and inoffensive” and sacked those identified as militant. In the short term, in the battle for power and ‘dignity’ in 1911 as in 1913, it was the house of capital that carried the day. Coming away from Conor McCabe’s talk, delivered in the former British military barracks of Beggars Bush, now part-occupied by the Labour History Society and festooned with the Starry Plough and pictures of the Citizen Army, I pondered the significance of the 1911 strike. The strikes of the 1910s were equally battles over ‘dignity’ or personal power, as economics. The same could be said for radical nationalist attitudes towards independence. The labour disputes of 1909-1913 did not prefigure a social revolution in Ireland, but they did precede by a few years, armed nationalist revolt, in which organised labour did play major role. Was there a connection? Certainly Irish Freedom, the Irish Republican Brotherhood’s newspaper thought so. Of the railway strike it wrote, “we disagree that the workers must surrender”. It denounced the, “vast amounts of unmitigated rubbish written on the horrors of socialism”, And argued for a compulsory system of grievance resolution for workers. Some strikes it argued, were the fault of employers and some of workers, “but the vast majority are the direct result of the British connection”. “Class War”, it argued, was, “incidental to commercial decadence”. “Independent Ireland would of course, have disputes between capital and labour, but they would be fights to re-adjust a balance, not a fight to the death”. One need not accept the IRB’s somewhat narrow-minded nationalist analysis here. Of wider significance is the common attitude of defiance. The Irish Worker, wrote that they would not be ‘crawling’ to the employers in the future. Irish Freedom wrote of Home Rule, “concessions be damned…Ireland wants no concessions from England, we want what is ours”. By the early 20th century, systems of deference, power and control that had sustained the ancien regime in Ireland were breaking down. Battles over power, both political, economic and over personal autonomy or ‘dignity’, were all in the air. Check out Conor McCabe’s blog, Dublin Opinion. Written by: John_Dorney on 9 March, 2011. Last revised by: Publisher26 August, 2013. 8 Responses to "The Great Southern Railway Strike of 1911"
Thanks very much for the review, John! Much appreciated. Conor, a pleasure, enjoyed the talk. Excellent talk and perceptive comments. The Great Southern Railways came into being in 1925, a grouping of all railways operating wholly within what was then the Irish Free State. References to ‘Great Southern Railway’ when the company the piece refers was actually the ‘Great Southern & Western Railway’ just cause confusion. Didn’t know much at all about this! My great-grandfather was a blacksmith for the “Great Southern”. My grandfather went to work there too. He was one of the 10% let go in 1911!!! If it weren’t for that I wouldn’t be here! The family talks very little about this but we’ve always been pro-union!! I have always believed in the unions. My grand father ‘ John Moriarty’ moved his whole family from Carlow, working on the railway to Tralee, Co. Kerry around 1900 .